MAKE Hardware Innovation Workshop, May 14-15 @ College of San Mateo « Adafruit Industries – Makers, hackers, artists, designers and engineers! Early bird pricing before April 15th for the MAKE Hardware Innovation Workshop coming up this May at the College of San Mateo! Join MAKE for its second annual Hardware Innovation Workshop. This award-winning business event shines the spotlight on the most interesting and innovative tools and technology, platforms and projects, and devices and designs based on open source hardware. The 1-1/2 day event kicks-off Tuesday with a VC panel, “Pitch Your Prototype,” and “Getting Started,” case studies of maker pros with early stage products. The Innovation Showcase follows, a unique opportunity to casually engage with over two dozen makers who have their cutting-edge products and devices on display. Creating an almost magical atmosphere where hardware innovation and creative genius generates spirited ideation, the Innovation Showcase is not to be missed. 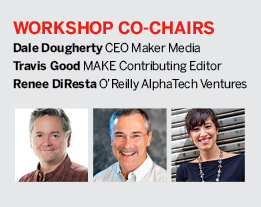 Wednesday is an all-star lineup with over 30 speakers representing leading entrepreneurs and thought leaders at the forefront of the maker movement. Investors, industrial designers, product development teams—anyone looking for insight into the early stage companies with the potential to change the global business landscape—should attend. Register today for early bird prices. This year we’ve added a half-day session for maker pros looking for guidance and insight into getting their projects and ideas to the next stage. Beginning at 10am to 1pm, Tuesday, May 14, the three-hour manufacturing deep dive is designed for makers exploring options for getting to scale with their final prototypes. Presented by experts who can facilitate the transition and have extensive experience in small, medium, and large scale manufacturing for startups. Participants are encouraged to bring their designs and prototypes to the workshop.